2016 was a seminal year for the world of video games. Virtual reality made its commercial debut, Nintendo broke into the mobile space, and the entire world briefly embraced its inner gamer during the summer of Pokemon GO. It was also a significant year for the modern shooter (with at least nine major releases for the genre) and for games nearly ten years in the making, like The Last Guardian, Final Fantasy XV, and Owl Boy. Most notably, this year saw a robust and diverse array of high-quality games. Titles like Mafia 3, Oxenfree, The Last Guardian, and Firewatch excelled in video game storytelling, while games like Hitman, Thumper, Superhot, and Overwatch delivered memorable and electrifying gameplay. In accordance with annual tradition, Gaming Trend’s editors and contributors recently sat down and discussed at length this year’s most spectacular experiences, and we finally decided on a list of titles that we feel best reflects the year’s excellence in gaming. 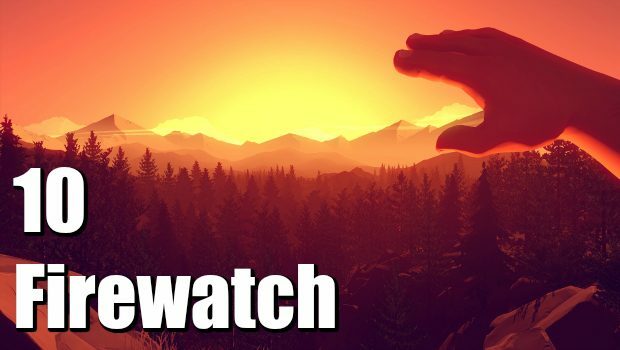 Firewatch is a game about escape. Campo Santo offers players a breath of fresh air through a curmudgeonly middle-aged man as he flees the unfaceable truths of his life. Henry’s retreat to the Shoshone National Forest serves as an escape for both the player and Firewatch’s anti-hero. Though the tasks of a Wyoming fire lookout may sound mundane on paper, every scouting hike and delivery pickup is a welcome excuse to explore this quaint, beautifully rendered world. The game’s central plot relies on conventions like mystery and suspense, but its soul is in its setting and its characters. While Henry is a likeable and pitiful grump, Delilah easily steals the show as one of the most charming and believable characters in video games. Some of the greatest voice-acting performances are featured in Campo Santo’s premiere title, and all of it is delivered seamlessly and effectively through the game’s branching dialogue systems. Each variation of Henry and Delilah’s witty exchanges feel genuine and cringingly dorky. A mature and humble story with an astonishingly pretty world, Firewatch deservedly makes our top-ten list for 2016. Planet Coaster is an absolute triumph for fans of the coaster building genre. It innovates and iterates on nearly every aspect, from pathing and scenery to coasters and crowds. Since the game launched on November 17th, 2016, fans have built 339,234 new objects, themes, and more (and that’s not a typo). Some have taken it to a whole other level, recreating Disneyland attractions like Space Mountain and Tinkerbell’s Castle, a recreation of Minas-Tirith from The Lord of the Rings, Hogwarts castle from Harry Potter, and even thematic rides like one based on the hit game Firewatch. I’ve even been to a virtual Six Flags Over Texas, with the real one being less than an hour away for comparison. The support for this game is absolutely staggering, both from the community and from the developers themselves. There truly is unlimited potential for Planet Coaster. If you are a simulation fan, it should already be in your library, and it certainly makes our list of 2016’s top ten games. In 2010, Playdead Studios was put on the map when it released the highly praised puzzle platformer, LIMBO. The studio has reached even more acclaim thanks to the release of its second game, INSIDE. Playdead’s incredible use of visuals brings the grim and eerie world that is INSIDE to life in a way that you don’t typically see in gaming, or in other mediums at that. Creating such a dynamic and powerful story without the use of any dialogue sets the game apart from many other games in the genre and the industry. Every moment spent playing INSIDE is as tense and intriguing as the last. Your descent into the dark and dreary world is draped in the dour sounds that surround you, while a wonderful use of music adds emphasis at just the right points. Inventive puzzles are set up to challenge players while not being so difficult that they become frustrating. Playdead outdid themselves when developing INSIDE, an incredible puzzle-platformer and easily one of the best games of 2016. Launching on January 4th, Pony Island was one of the first games on Steam in 2016, and it’s a testament to Pony Island’s quality that it’s managed to stand out in my memory for the rest of the year. While the “arcade cabinet built by Satan” premise isn’t anything new, Pony Island not only breaks the fourth wall, it has no fourth wall in the first place, featuring an engrossing story that could only be told in a video game. Satan isn’t called a master manipulator for nothing, and he’ll get your soul by any means necessary, leading to tons of tricks, riddles, and “Ah ha!” moments when you finally solve a seemingly impossible puzzle. There’s quite a lot of content as well, including hidden areas and secret encounters, as well as three particularly unique boss fights. This is a game that attempts to constantly shock and surprise, and succeeds because it never uses the same tricks twice. If you’re looking for a totally original puzzle game, look no further than Pony Island, 2016’s premiere satanic arcade cabinet. Titanfall 2 is the realization of Respawn’s shooter concept, a true successor to the blueprint put forth by the first Titanfall and a spiritual successor to Modern Warfare’s past. More than any other modern shooter, it nails feels in tangible ways; the heft of the guns, the crisp pop of hits registered, and the smooth movement in and around TF2’s vertically diverse arenas. Titanfall 2 excels on all fronts thanks to nailing the fundamentals better than any other and crafting a campaign that isn’t afraid to make use of every tool in your arsenal, from guns and mechs to movement itself. Titanfall 2’s single-player campaign delivers heart-stopping action and moment-to-moment thrills that keep players on their toes. Not only does Respawn craft some of the most intuitive ways to introduce players to new mechanics and combat scenarios, but they introduce you to Gaming Trend’s “Best Character.” Your Titan BT is with you throughout your journey and makes the whole experience that much more enjoyable. You didn’t know you could care for a hunk of metal this much until you’ve met BT. Arkane Studios is quickly establishing itself as this industry’s greatest creator of virtual playgrounds. True to the creator’s mantra of always saying “yes” to the player, Dishonored 2 offers players a brand new bevy of creative abilities alongside those of its predecessor. New abilities like Emily’s Far Reach and Domino fit the game’s extreme and robust toolset, while Corvo’s returning Blink ability remains one of the coolest super powers in 3D video games. Few experiences this year felt as thrilling as finding a pack of Howlers, silently planning my pursuit, and executing my attack with murderous grace. A noble contender would be Mission 7: A Crack in the Slab — an incredible display of level design mastery which introduces an entirely new dimension of experimentation to a franchise predicated on just that. And all of this takes place in a beautifully hand-crafted world brimming with stories to stitch together — the breadcrumbs of hidden tales strewn about Dishonored 2’s cupboards and locked rooms. It’s unfortunate that the core narrative is such a bore, but this is made up for tenfold with robust and inviting level design, staggeringly pretty art design, and some of the most open-ended and powerful gameplay featured on our list of 2016’s greatest games. While many video games astound audiences with powerful visuals and high-octane gameplay, The Witness invites players to marvel at their own intellect. Jonathan Blow’s sophomore title focuses on a single concept and extrapolates it across an entire island packed with puzzles to be discovered and mysteries to be pondered. It consistently and coherently presents itself in ways conducive to teaching the player its vast array of mechanics. Progressing through The Witness, uncovering its secrets, and even appreciating the world’s mysterious architecture requires a cultivated and established knowledge of the game’s systems. Each and every visible facet of the game begs to be scrutinized from every available angle. And as you do so, your mind is constantly mulling over the spaces you have visited and the puzzles you’ve encountered, until finally — Eureka! The Witness is a masterful collection of epiphanic moments which easily makes our list of this year’s top ten video games. Battlefield 1 takes DICE’s long-running franchise to a new war and new heights of greatness. With spectacular visuals, stunning audio, and blistering combat complete with bayonet charges, blimps, and bombs, Battlefield 1 delivers unparalleled multiplayer gameplay. Supplemented by the IP’s best single-player campaign to date, Battlefield 1 is the definitive shooter of this generation, combining the elements of all-out warfare into a seething mass of pure destructive joy that is perfectly punctuated by emotional and historical significance. With loads more content on the horizon, Battlefield 1 will stand tall for years to come. As a contender for best shooter of 2016, it will have you staring into the adrenaline-filled depths of your TV and twitching like a red-eyed junkie after you put it down. Blizzard’s team hero shooter deserves every bit of praise it’s elicited since it launched back in May. The gameplay in Overwatch is so hyper-accessible that my 12-year-old brother can enjoy his playtime just as much as me, and the game’s growing roster of heroes caters to such a variety of playstyles that every player can play to their strengths and still feel critical and important. The game may have been light on content at launch, but Blizzard’s continued support, in the form of new maps, heroes, game types, and meticulous character balancing has resulted in a game that always has something new to offer. Even when new in-game content is in short supply, Blizzard has worked hard to keep its community engaged — from intricately designed augmented reality games to endearing Pixar-style animated shorts. And I would be utterly remiss to exclude mention of Blizzard’s dedication to diversity. Overwatch sets an industry standard for inclusiveness and representation, populating its world with diverse peoples and cultures without dipping into stereotypes. This point alone is enough to warrant Overwatch serving as a Game of the Year contender. Uncharted 4: A Thief’s End’s history becomes its greatest strength both as developer Naughty Dog effectively builds upon a decade’s worth of mechanical improvements and pays tribute to the life of Nathan Drake. While the finale keeps in-line with the series’ larger-than-life action set pieces and unrivaled cinematic action, Uncharted 4 stands out from its predecessors in its ability to hold back and tell a story about its hero’s humanity and the lessons he’s learned in the years we’ve spent in his shoes. Uncharted 4 says goodbye to an icon, and in doing so becomes a showcase in everything Naughty Dog does well, and in several cases, better than anyone else in the industry.